Life is a reflection of our intentions and attitude. Our lives simply mirror our output, unfiltered and directly correlated to the source of our way of being. It is as if life is a bell and the output is determined by how we strike it. Take a passive approach and give life a tiny ping, in turn life gives you muffled, faint sounds that lead to frustration, uncertainty and a lack of accountability. Our natural inclination is to point fingers elsewhere and blame others and even life itself. This is what victims do in life. Life is a story of what is wrong and who is to blame, and our misfortune and even lack of luck in why things do not turn out different. Our fingers point outward and all of our power is lost. It is impossible to have power in our lives when we do not take accountability. We alone are 100% responsible for our lives. There is only one place to look at the quality of our lives and that is in the mirror. Look in the mirror. Not in passing, not for a second, but truly look. What do you see? This is your life. Look again. Look deeper. Life is reflecting all of this. All of your fear, your chaos, your lack of integrity. The universe speaks the truth, there is no bias, it is simply reflecting your output, nothing more nothing less. If you are outputting lies and worried about judgment then your life will reflect this. If you are angry then life will be angry to you and others will see you and be angry around you. If your life is chaotic and unsettled, look in the mirror there is something there for you to be responsible for. There is no place else to look. Spending a life trying to change others will make no difference to you. This is an endless journey of making others wrong and trying to prove that you are right. Buy a mirror, this is a far more frugal investment and will save you a lifetime of pain. There is only one person you have the power to change and that is yourself. 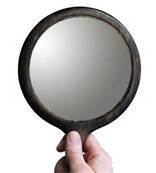 Look in the mirror and get straight with yourself on how you view life, what do you see? How do you treat others? Here lies the secret. What you create, what you put out in life will reflect directly back to you. If you want love then love. If you want to be listened to then listen deeper than you ever have. If you want others to stop judging you then stop judging yourself and people in your life. As Leo Tolstoy said, “if you want to be happy, be.” Life is this direct correlation to your intent and attitude. It is this simple, yet it takes something. It takes being straight. We are not straight with the energy we put in this world. We mask it with fake happiness, and lies. We lie to others and more importantly we lie to ourselves. We mask our fears with these lies and we pretend life works. We are not straight with anyone and yet we wonder why our life is not working. We wonder why others are not being straight with us or why we are dissatisfied. We lightly ping the bell and yet we keep looking for a grandiose symphony. Look in the mirror and get straight with yourself. This is life, this internal battle of clearing negative intentions with that of purity and positive energy. This was the legend of King Arthur and the Excalibur sword. Only the pure of heart could remove the sword from the stone. This is the quest. Look fear in the eyes and let it go. This is not you. You are an extraordinary individual filled with love, with happiness, with creativity and inspiration. All of your negative emotion and fear is simply a mask that keeps you from the life that you want. You alone are responsible. You alone can create your life. Look in the mirror. Ring the bell. The sounds are glorious as are you. Look in the mirror, deeply look. Get straight about what you see. Do you see happiness and love or do you see and feel fear? Get straight about what energy you are putting out into this world. Write down what you see and put this aside. Create what you want and put this energy out. If you want love, be loving. If you want happiness be happy. If you want abundance be abundant. Take on 100% responsibility for your relationships and your life. There is no where else to look.